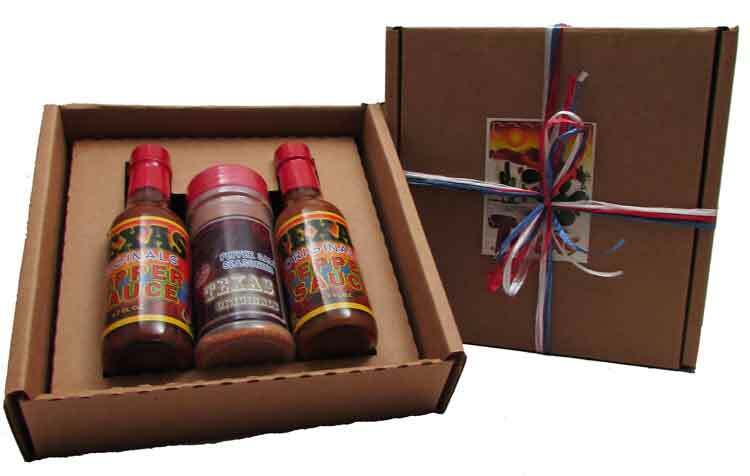 All Natural premium Texas Pepper Sauces (2 - 5.7 ounce bottles) and 6 ounces of Texas Originals Pepper Salt Seasoning (salt, cayenne pepper, garlic & seasonings) in a gift set with a "Texas" label on the front. Tied off with pearlized raffia. Includes a Handwritten Greeting Card. Note: We can put a "Dallas" label on instead of "Texas". These products are made in the metroplex.